10/5/2017–CHARLOTTE, NC–As World War II raged around the world, one American bomber rose to prominence, darkening the skies of occupied Europe. The Boeing B-17 became known as the “flying fortress” because of its 13 mounted .50 caliber machine guns and its ability to take copious amounts of damage and still bring her aircrews home. Of the 12,731 B-17’s produced from 1936 till 1945, there are only 46 remaining B-17 airframes around the world and only 11 of those remain airworthy today. Recently the Liberty Foundation came to the Concord Regional Airport and flew one of those 11 B-17’s around Charlotte in an effort to raise money to honor wartime bravery and to put more B-17s back in the air. Weeks before, at the request of Concord Regional Airport, the Liberty Foundation contacted Major Brett Benson and the Civil Air Patrol for volunteers to support their event. Major Brett Benson, of the 121st Charlotte Senior Squadron, led a joint operation including additional members of the Concord Regional Airport, the Charlotte Senior Squadron, the South Piedmont Senior Squadron (NC-137), and the 111th Search and Rescue Squadron. 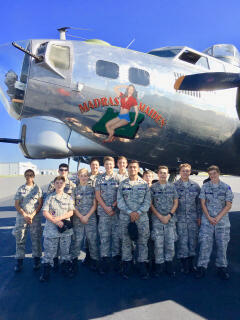 During the event, the cadets and senior members assisted with parking visitors and directing them to transportation to the main terminal; staffing cordoned ramp areas for safety and security; manning a CAP recruiting booth; and providing visitor escorts between the visitor viewing area over to the "Madras Maiden" aircraft located on the ramp at the Concord Regional Airport. This visit marks the first time this rare aircraft, the “Madras Maiden,” has been in the Charlotte area. The B-17 was utilized in every theater of operation during World War II, but was operated primarily by the 8th Air Force in Europe. Operating from bases across the United Kingdom, a typical B-17 mission often lasted for more than eight hours and struck targets deep inside enemy-occupied Europe. During the war, B-17’s dropped 640,036 tons of ordinance on European targets in daylight raids. The Madras Maiden, B-17G 44-8543 was built by Lockheed-Vega and accepted by the USAF on October 17, 1944. The B-17 was assigned to the Flight Test Branch at Wright Field and modified to be a “Pathfinder” aircraft and equipped with the H2X “Mickey” radar system in place of the ball turret and never saw combat. The aircraft spent its entire military career as a research and development aircraft. From the B-17’s that were converted to become “Pathfinder” aircraft, Madras Maiden is the only one left in existence. In 1959, it was sold to a private company and used to transport produce from the Caribbean to Florida. Four years later, it was sold to the U.S. Department of Agriculture and used as a fire ant sprayer. In 2013, then “Chuckie” was sold to the Erickson Collection, an aviation museum in Madras, Oregon. Restored to her combat configuration and painted in the colors of the 381st Bomb Group, and sporting the Madras Maiden nose-art, she flies today to honor our veterans, educate current and future generations as to the high price of freedom and to preserve our aviation heritage. This year’s Salute to Veteran’s tour will be continuing on to Columbia, SC, Charleston, SC, Chattanooga, TN, Louisville, KY, Nashville, TN and Memphis, TN after leaving Charlotte. On 27 and 28 September, CAP will again be providing similar support to Concord Regional Airport with ground tours of the Spirit of Freedom, a Berlin Airlift C-54 flying museum.